To amend Clausewitz on war, one might say that the trial in a courtroom is the pursuit of battle by other means. And, short of the horror on the battlefield, to be on trial is perhaps the most traumatic of all life experiences. Yet in the great trials of history much more than individual destinies are at stake. Fundamental issues of morality, political expediency, justice and social change are being engaged. How does one balance freedom of conscience against the public good? How does one contest unarguable social evils when the sheer weight of political institutions is against one? Why have so many great men and women been sacrificed by a remorseless ‘system’? To what extent do legal systems deliver true justice? 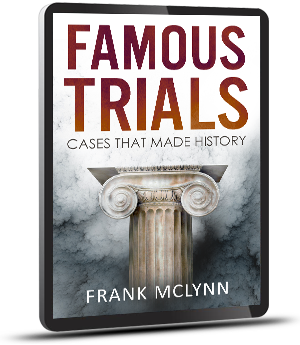 An investigation of famous trials in history takes in such great historical figures as Socrates, Jesus, Galileo, Sir Thomas More and Mandela as well as the famous Dreyfus case, the Nazi war crimes tribunal at Nuremberg, the Stalinist purges and the revolutionary chaos that engulfed England and France in the seventeenth and eighteenth centuries. The great American criminal lawyer Clarence Darrow duly makes an appearance, as do such varied and heterogeneous figures as Oscar Wilde, John Brown,Madeleine Smith and the Tolpuddle Martyrs. Frank McLynn presents evidence from thirty-four different trials drawn from military, ecclesiastical and civilian court cases, not to mention special courts and tribunals, taking in all eras and covering a dozen different countries. It is not too much to say that the world we live in has been shaped in part by the decisions and results of these trials.